What’s above represents the tasks that I think are most important to do a School Library, as you can see they’re grouped in a way that made sense to me. Since I worked on this spectrum in class, I’ve combined a number of things that seem to fit together better so that I feel this is a good representation of my thoughts for creating an effective and welcoming library environment. I think they all need to be done and when it comes down to the day to day running of a library, all of these will be mixed and changed depending on how that school is run and what they feel is key. To connect to that, in class we spoke about mission statements, which can be a really powerful way to connect to people working within the school and also from outside. Its really fascinating how a mission statement is trying to do so much and how sometimes the way it connects to the goals is not as specific as it could be. So in groups we worked on putting together mission statements for imaginary schools. The one that I and LibraryGirl chose was called Sacagawea Elementary School; a forward thinking magnet school with a focus on holistic and collaborative learning. The mission of Sacagawea Elementary School is to develop the child’s identity as a whole individual and to encourage collaboration between students and teachers. To expand on this and create a mission statement for the library is actually quite hard since I think that a library within this school wouldn’t actually have that many changes from their mission. Since the library would hope to be at the heart of all of the collaborations between the students and teachers. Perhaps the wording might be slightly altered to give a sense of the library’s place. Sacagawea’s Elementary School Library strives to be a place which helps to develop the child as a whole individual and be a fertile ground for collaboration between students and teachers. 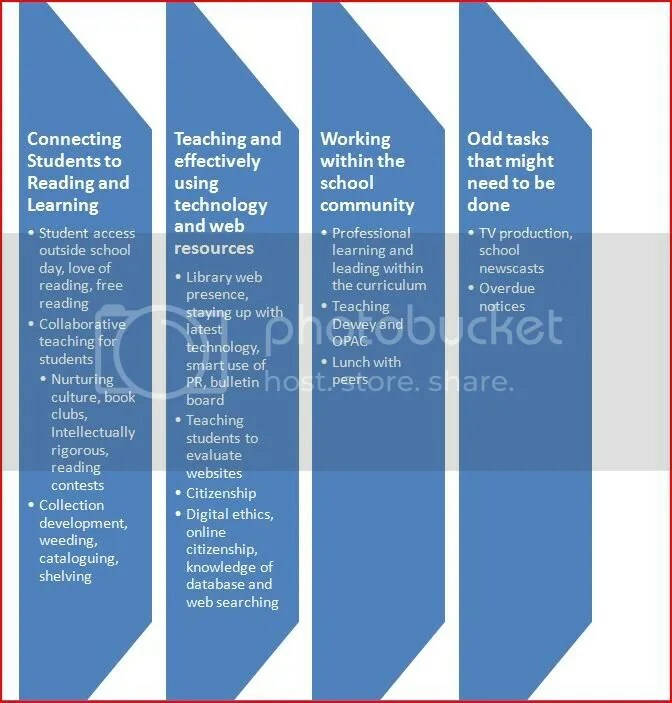 In terms of the class discussion, I agree with LibraryGirl that I never realized just how much of what a school librarian did was connected to evaluating technology resources. I think that I was aware of how libraries tend to be the place where technology is really put into use, but thinking about how the librarian is truly the leader in choosing and understand how and why they’re used was a nice thing to learn. Also the discussion and all the distinctions between visions, mission statements and goals really helped me get a better sense of how hard they are to get right and how effective they can be. Good work on the library mission statement! It’s specific enough to mean something, and also completely achievable, while being noble and inspiring. I echo M’s comment. Definitely reflects both the school’s goal and the role of the library in meeting that goal. Nicely done! Also – the graphic is well-done and thoughtful. Nice work.